Roman emperor from 222 to 235; was especially friendly to both Jews and Christians. 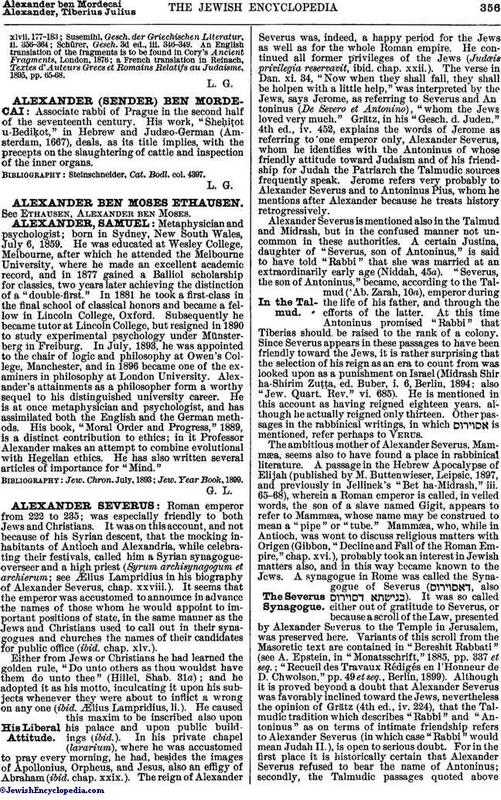 It was on this account, and not because of his Syrian descent, that the mocking inhabitants of Antioch and Alexandria, while celebrating their festivals, called him a Syrian synagogue-overseer and a high priest (Syrum archisynagogum et archierum; see Ælius Lampridius in his biography of Alexander Severus, chap. xxviii.). It seems that the emperor was accustomed to announce in advance the names of those whom he would appoint to important positions of state, in the same manner as the Jews and Christians used to call out in their synagogues and churches the names of their candidates for public office (ibid. chap. xlv.). Either from Jews or Christians he had learned the golden rule, "Do unto others as thou wouldst have them do unto thee" (Hillel, Shab. 31a); and he adopted it as his motto, inculcating it upon his subjects whenever they were about to inflict a wrong on any one (ibid. Ælius Lampridius, li.). He caused this maxim to be inscribed also upon his palace and upon public buildings (ibid.). In his private chapel (lararium), where he was accustomed to pray every morning, he had, besides the images of Apollonius, Orpheus, and Jesus, also an effigy of Abraham (ibid. chap. xxix.). The reign of Alexander Severus was, indeed, a happy period for the Jews as well as for the whole Roman empire. He continued all former privileges of the Jews (Judœis privilegia reservavit, ibid. chap. xxii.). The verse in Dan. xi. 34, "Now when they shall fall, they shall be holpen with a little help," was interpreted by the Jews, says Jerome, as referring to Severus and Antoninus (De Severo et Antonino), "whom the Jews loved very much." Grätz, in his "Gesch. d. Juden," 4th ed., iv. 452, explains the words of Jerome as referring to one emperor only, Alexander Severus, whom he identifies with the Antoninus of whose friendly attitude toward Judaism and of his friendship for Judah the Patriarch the Talmudic sources frequently speak. Jerome refers very probably to Alexander Severus and to Antoninus Pius, whom he mentions after Alexander because he treats history retrogressively. 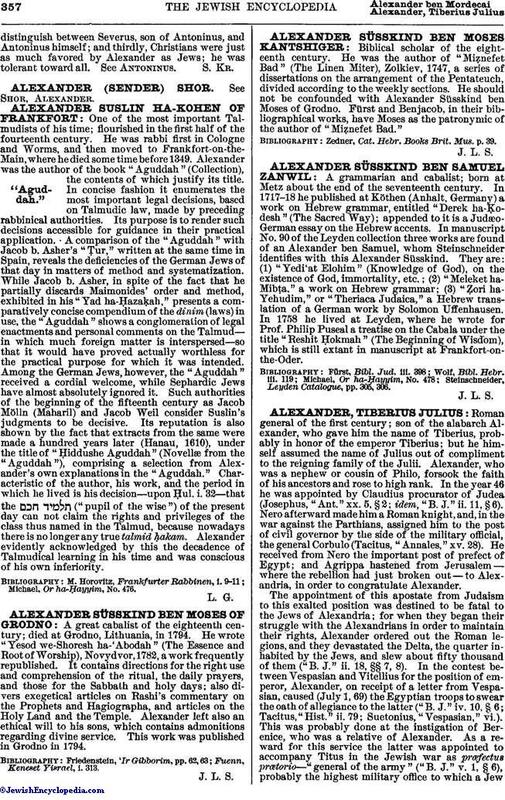 Alexander Severus is mentioned also in the Talmud and Midrash, but in the confused manner not uncommon in these authorities. A certain Justina, daughter of "Severus, son of Antoninus," is said to have told "Rabbi" that she was married at an extraordinarily early age (Niddah, 45a). "Severus, the son of Antoninus," became, according to the Talmud ('Ab. Zarah, 10a), emperor during the life of his father, and through the efforts of the latter. At this time Antoninus promised "Rabbi" that Tiberias should be raised to the rank of a colony. Since Severus appears in these passages to have been friendly toward the Jews, it is rather surprising that the selection of his reign as an era to count from was looked upon as a punishment on Israel (Midrash Shir ha-Shirim Zuṭṭa, ed. Buber, i. 6, Berlin, 1894; also "Jew. Quart. Rev." vi. 685). He is mentioned in this account as having reigned eighteen years, although he actually reigned only thirteen. Other passages in the rabbinical writings, in which is mentioned, refer perhaps to Verus. The ambitious mother of Alexander Severus, Mammæa, seems also to have found a place in rabbinical literature. A passage in the Hebrew Apocalypse of Elijah (published by M. Buttenwieser, Leipsic, 1897, and previously in Jellinek's "Bet ha-Midrash," iii. 65-68), wherein a Roman emperor is called, in veiled words, the son of a slave named Gigit, appears to refer to Mammæa, whose name may be construed to mean a "pipe" or "tube." Mammæa, who, while in Antioch, was wont to discuss religious matters with Origen (Gibbon, "Decline and Fall of the Roman Empire," chap. xvi. ), probably took an interest in Jewish matters also, and in this way became known to the Jews. A synagogue in Rome was called the Synagogue of Severus ( , also ). It was so called either out of gratitude to Severus, or because a scroll of the Law, presented by Alexander Severus to the Temple in Jerusalem, was preserved here. Variants of this scroll from the Masoretic text are contained in "Bereshit Rabbati" (see A. Epstein, in "Monatsschrift," 1885, pp. 337 et seq. ; "Recueil des Travaux Rédigés en l'Honneur de D. Chwolson," pp. 49 et seq., Berlin, 1899). Although it is proved beyond a doubt that Alexander Severus was favorably inclined toward the Jews, nevertheless the opinion Grätz (4th ed., iv. 224), that the Talmudic tradition which describes "Rabbi" and "Antoninus" as on terms of intimate friendship refers to Alexander Severus (in which case "Rabbi" would mean Judah II. ), is open to serious doubt. For in the first place it is historically certain that Alexander Severus refused to bear the name of Antoninus; secondly, the Talmudic passages quoted abovedistinguish between Severus, son of Antoninus, and Antoninus himself; and thirdly, Christians were just as much favored by Alexander as Jews; he was tolerant toward all. See Antoninus.